New York, NY: HarperPrism, 2000; $25.00 hardcover; 431 pp. This review originally appeared in the August 2000 issue (#144) of The New York Review of Science Fiction. 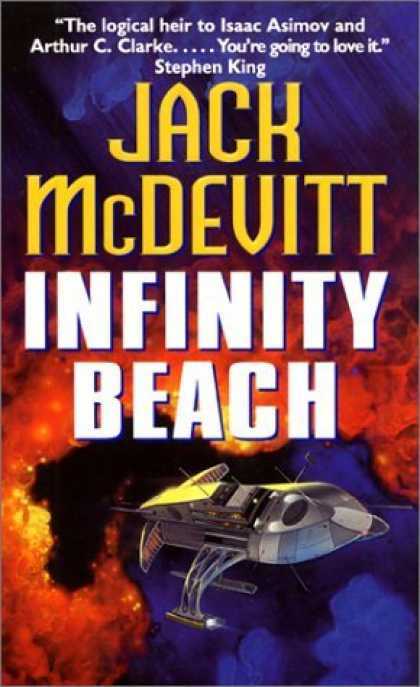 “For intelligence and clarity, Jack McDevitt is the natural heir to Isaac Asimov.” After reading a few of McDevitt’s novels, it’s not hard to see why this quote from Michael Swanwick has appeared on the cover of a couple of McDevitt’s other works. With an incredibly clear and unobtrusive (almost to the point of simplistic) style, McDevitt seems to want to relate his story to the reader as transparently as possible, as if he doesn’t want you to notice the writing at all, just the story itself. But the similarity between McDevitt and Asimov is much more than stylistic. Like Asimov, McDevitt’s strength lies in the story itself, with the characterization taking a back seat to the plot and subplots. This is not to say that McDevitt cannot give us quality characters. Rather, it is the events and their unfolding that draws our attention. As a result, novels such as Engines of God, Ancient Shores, and Eternity Road end up as incredible page turners that completely absorb you until the last page. However, McDevitt’s recent writing contains a weakness which becomes apparent only through reading many of his novels: the basic plot remains eerily the same–a hard-to-overlook problem if one writes plot-driven novels. In each of the novels above, artifacts/remnants from a different civilization (either human or alien) lead a team of characters headed fully or in part by a strong female on a virtually single-minded hunt to discover why and/or how they were built and what their existence can tell them. Inevitably, due to perilous situations people die during the quest, and events build to a crescendo where it appears that many, if not all, of the remaining principals involved will die. McDevitt is deft enough as a writer to hide the similarities with just enough differences in locations, types of characters, pace and subplots that initially you don’t seem to mind or even really notice. Yet, after reading the three novels above consecutively, I was looking for something different when beginning his most recent novel, Infinity Beach. Ostensibly a mystery novel, the problem for me with Infinity Beach is that it difters only a little from the previously mentioned works. In it, Dr. Kim Brandywine is haunted by her older sister’s disappearance years earlier. Coincidentally, the other three members of the Hunter, the ship her sister last served on before her disappearance, also died or disappeared under mysterious circumstances after their return. That previous investigations into those deaths and disappearances ended inconclusively only adds to the unease Dr. Brandywine has felt over the years. Yet, she takes no actions of her own until an old college professor of hers, who happens to be the father of another member of her sister’s ill-fated crew, gives her new details that start her on a hunt for the truth behind what happened to her sister. These details lead to other clues that lead Kim to the realization that a cover-up has taken place regarding her sister’s last mission, which was to find proof of alien life in an apparently barren galaxy. As with his other recent works, McDevitt manages another pageturner. Kim’s action-packed investigation moves at a rapid pace, and despite the fact that her sister’s disappearance occurred decades before, the sense of urgency that pervades the novel seems absolutely appropriate. Additionally, Dr. Brandywine is a likeable, engaging and intelligent character, the type of strong female that is missing from much of the hard sf genre. The lone drawback to her character is that she is so focused during the events of the novel that you wonder if she is registering anything outside the bounds of her investigation. Fortunately, McDevitt’s flowing style masks this problem somewhat and allows you to devour pages at a time with tremendous ease. Kim provides us with the strong female leading a few other characters on a virtually single-minded hunt to unravel a mystery. During her quest, Kim’s boyfriend dies while protecting her (as do a few other characters who would have been red-shirts on Star Trek), and once again events build to a climax which may mean death for many of those involved, including Kim. In fact, as you read the novel, you see that McDevitt has a hard time leaving alien civilizations alone. While McDevitt is great at telling a story, he seems to be telling the yet another variation on the same basic plot. Even though the remnants from a different civilization are missing, the lack of them provides much the same impetus for the characters involved. During the course of her investigation, Kim finds that the reason for the cover-up is a botched first contact which resulted in the death of her sister as well as the abduction of an alien and its vessel. Admirably, McDevitt’s alien is truly alien; a lite form resembling a butterfly and many times smaller than humans, and as you learn more about this life form, it becomes all the more understandable how the initial contact between the two races was so horribly botched. Nonetheless, it would be nice to see McDevitt write about the dual human desire for knowledge and for solving mysteries without placing it in the context of foreign/alien constructs; i.e., better still to see McDevitt tackle a completely different type of plot with different types of characters. Yet, you need not let these quibbles deter you from picking up Infinity Beach. McDevitt tells the tale in a gripping fashion that thoroughly entertains and absorbs you in its unfolding drama. Those who like his previous work and enjoy a sense of familiarity with their fiction will enjoy this novel all the more, while those who have not read his writing will be reminded that characters don’t necessarily need to drive the tiction and that the story can drive it. This entry was posted in Book Review, Jack McDevitt, Matthew Appleton. Bookmark the permalink.